The Alphablocks Reading Programme consists of 15 magazines along with lots of extras such as flash cards, gold stars, Alphablock phonics tiles, stickers, games and more. It is aimed at young children aged around 4yrs old who are just beginning their journey into the world of phonics and learning to read. The Alphablocks Reading Programme comes in 3 parts, each delivered to your door in in sets containing 5 magazines along with lots of extras. For a price of £39.99 plus p+p, I think this is very reasonable having seen what is included. When we opened the first set, Mister B’s eye’s lit up at the array of goodies inside. He couldn’t wait to start looking at the magazines and doing the activities. He loves the Alphablocks from the television series and several DVD’s that we have so was immediately familiar with what he saw and due to the recent phonics lessons he’s been having at school, he was eager to pick out letters and sounds he knew and tell me them. Mister B has just turned 4 but still at pre school until next September. Being one of the oldest in his class and quite able, he joins the foundation class for phonics lessons each morning, so the Alphablocks Reading Programme is a great way for me to build upon what he has learnt and encourage him to learn to read. 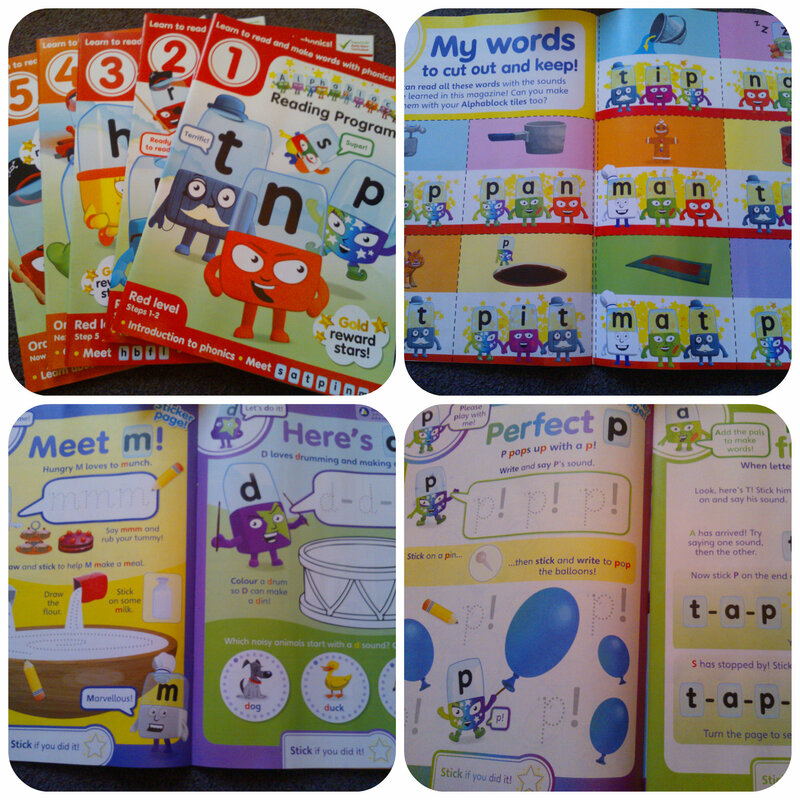 The magazines are packed full of fun phonics activities that completely captured Mister B’s attention, he was eager to work through them and found it fun. I was so thrilled when he blended some letters to create his first word. I then found some of the letter tiles really useful to make various three letter words that he could sound out and say. The activities in the magazines are really varied to help maintain interest, from tracing letters, using stickers, colouring, to fun games and things to cut out. I really think they are perfect for us and are great to sit and do on the days we are at home together. We only do a few pages at a time to give Mister B time for all his new knowledge to sink in, but as long as he is enjoying it then I happy to sit and encourage him at home. Alphablocks have really thought about this reading programme and it really seems to hit the mark with little ones. My children have always loved magazines so to incorporate the learning into a magazine style format has really worked. I do think the extras help as well, the learning tiles are great, and Mister B always has to use the Alphablocks pencil in his magazines! All reviews are my own and my family’s opinions and we received the reading programme in order to write the review. This entry was posted in Reviews and tagged Alphablocks, magazines, phonics, reading programme by Fiona Martin. Bookmark the permalink. That is super! It is such a great help! Even for mummy! I have no clue of phonic, so this is great for us to learn together.